If I had to pick one knife to keep with me at all times, it would be SOG’s Seal Pup Elite. This knife is Sharp, VERY SHARP, and it holds its edge better than 90% of the knives on the market. The Seal Pup Elite is based on the same design that Navy SEALS use, so you know this knife is designed to take a beating. During testing, I threw everything I had at this knife. After cutting everything I could get my hands, and abusing this knife beyond what would be considered normal use, I’m extremely impressed by its durability and edge retention. After years of abuse, the SOG still holds an edge just as well as the day I got it and has no noticeable fracturing or edge-chipping. THE BLADE: The knife has a full tang US8 stainless steel blade that’s undergone SOG’s proprietary Cryogenic Heat Treatment process. SOG says this process strengthens the steel on an atomic level, increasing the blade’s durability and edge retention. While I can’t scientifically confirm the truth in that statement, I can say that my testing confirms that this was one tough blade. After going through their proprietary treatment process, the knife is then coated in titanium nitride which is supposed to help further strengthen the knife. 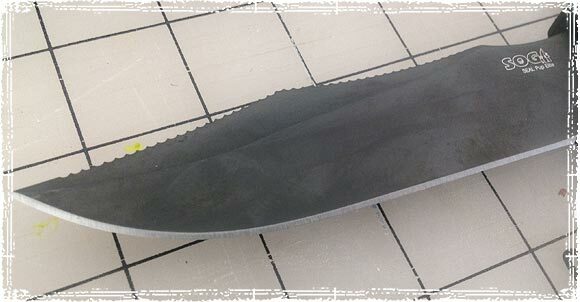 THE SIZE: The overall length of the blade came in at 4.85 inches, with the whole knife measuring in at 9.5 inches long. It weighs in at a comfortable 5.4 ounces, making it easy to carry for just about anyone. THE HANDLE is made with a glass-reinforced Zytel, with added finger grooves to give it a better ergonomic feel. It’s very comfortable in the hand and the design helps prevent fatigue and hot spots even after long periods of use. The textured scales make it extremely easy to grip, even in the water or during wet conditions. It’s my go to knife when I’m out on the water because the grip is probably one of the best I’ve found when wet. It may sound weird, but I absolutely love this sheath. I can’t tell you how many sheaths I’ve gone through on some of my other knives, but I can tell you this one has outlasted them all. I updated this review to let the readers know that six years later this thing looks almost the same as the day I got it. It’s made with reinforced Nylon, with a Kydex insert that protects the blade and stops it from moving around inside the sheath. It also has a pocket that is large enough to hold a multi-tool and a small flashlight or lighter. Cutting wood, meats, leather, rope, and basically anything I’ve needed to cut over the years. When I first posted this review, I did so after only a couple weeks of using the knife. Six years later and it’s still one of my favorite and most used knives that I own. For the last six years, I’ve used this knife to do everything from cut materials down in my shop, to using it as my primary blade when hunting and fishing. I’m still impressed with the blades ability to hold an edge over time. Using it on numerous occasions for Batoning. I love its ability to double as a pretty decent bushcraft knife. In my opinion, every survival knife should be able to hold up to this type of abuse, otherwise, what’s the point of carrying it. After years of abuse, and using it numerous times for splitting log after log, the knife still holds its edge with no visible damage to the blade. Wet Conditions. I use this knife when fishing all the time so it’s always getting wet. I’ve also done a few salt water tests, letting it sit for weeks at a time in a bucket of salt water, and it’s never caused any damage or rust on the blade. The knife is extremely sharp right out of the box and holds its edge without needing a whole lot of maintenance. I believe its hands down one of the best survival knives I’ve ever seen or used. It’s lightweight and a great knife for those looking to keep their pack weights down. I have seen some complaints from people, who didn’t like the nylon sheath, but you won’t hear any coming from me; in fact, I actually really like the sheath. It’s durable as hell and can take a beating. It also makes a nice little EDC survival kit, with the pocket giving you enough room to stash a small multitool, a lighter, and flashlight. The handles grip is top notch, and I really like the way this knife feels in my hand. The handle, which is made from glass-reinforced Zytel, has a textured feel that makes it literally stick to your hands. On a side note, I like the Seal Pup Elite’s handle over the normal Seal Pup because of its thicker and deeper finger grooves. Looking for a Good Sog Knife? 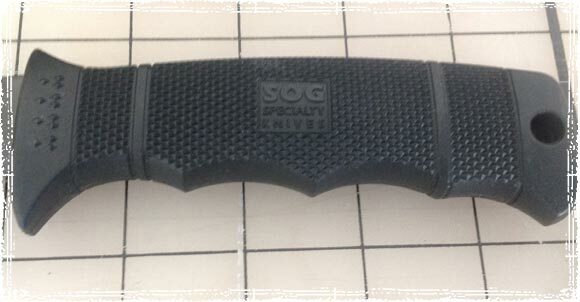 I recommend one of these Sog Knives. I have had one of the regular seal Pups for awhile and I love it. I have actually been thinking about getting one of the elites for awhile. I think I might have to now. I really like the blade on the Elite. I don’t use the serrated edge much on the pup so I think The elite would be perfect. One thing you should know about SOG. The majority of their knives are made in China. Take a good look at the fixed blade knives they produce now and compare it to the older original U.S. made knives. If you own a SOG with a thin blade compared to the older thick blades then you just got suckered out of a lot of money. Also if you are looking to buy a real fixed blade military fighting knife, you should focus on the blood grove and a High Carbon Steel blade. Thank you for that I fo. Now please tell what you would recommend. The so-called “blood groove” is a actually called the fuller and it has nothing to do with fighting or blood. It’s meant reduce weight without compromising strength. That is all. Oh, and some people think it looks cool. Dear ARC (12/14/15) God bless you. The last word in the first sentence is why we should avoid purchasing this product. Even if it was the best knife in the world, stay with America and / or friendly allies. Very cool, I was trying to decide between the seal pup and another brand but I think I am going to give the SOG a try. I like that the seals use it, if it’s good enough for them I’m sure it will do the job when I need it. There is no better knife than a SOG. I have 2 of them and I love them. I have this exact same knife and agree with your review. It’s a knife you can have trust in and carry in many different ways thanks to the very clever nylon sheath. I’ve put mine through he’ll and it’s still razor sharp and looking almost brand new. I chose this one over the standard Pup because of the size, it’s perfect. A truly fantastic knife, made to be used, and at a great price. I highly recommend. Great review. I love my SOG knives! I carry the FlashII daily and it’s almost worn out from SEVERE abuse! This knife has taken EVERYTHING. 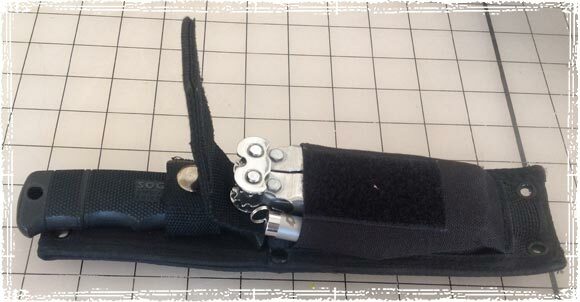 cAN YOU WEAR THE KYDEX SHEATH HORIZONTALLY FOR THE PUP ELITE OR JUST THE NYLON SHEATH? Great review. That’s my next suvival knife! Thanks for this post! I have been looking for a good knife for my husband and I. I think this is the one. The information you provided was great. Keep it up! I bought one based on your recommendation. Its a great knife.. very impressed. I have a couple of glock knives, which are also highly durable (big surprise, right!) but they aren’t hunting knives, definitely more combat oriented. (Which is not a bad thing mind you) The SOG pup is now in my outdoors bag. Thanks for the review. I agree with swgerberknives. Can we get a side by side look at the gerber lmf 2. Don’t forget the full sized Ka-Bar. ESSE RAT, Ka Bar, and Mora for me. However, I may try the SOG Seal pup elite, but most knife makers cringe when they hear SOG and say they would only trust it to slice their ham sandwich. They seem a bit biased and probably don’t like the fact that it is made in China. I have two of these SOG SEAL pups and and one full size and I think they are the best knife for the money. I have approx 15 “count on” knives and these would be at the top of my list. The Navy SEALs actually carry these albeit the larger version usually. I also like Gerber and Leatherman has also made a few knives that I like. I am unaware of any union knifemakers anywhere. As for the SOG being made in China, that cancels it out for me. Chinese have very little quality control. The SOG Seal PUP was made in Seki Japan until about 2006. After that SOG moved production of the Seal PUP AND added the Seal PIP ELITE under manufacture in Taiwan. Taiwan is not China. SOG’s fusion line and lowest priced products are made in China. 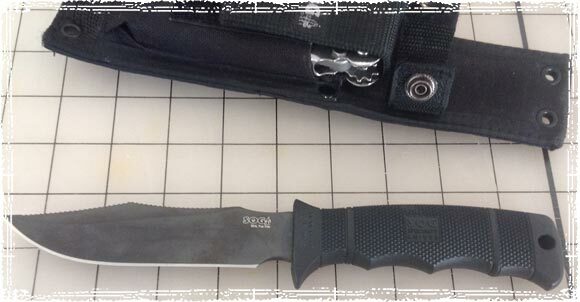 have you done any reviews on the ontario knives like the rtak II. Why not carry both? You can go back and forth about whether or not the SOG Seal Pup Elite is better than the Gerber LMF II. Each knife has excellent qualities that can be trusted. The Gerber LMF II has an excellent sheath that I use as a drop holster attached to my left leg while I carry the SOG Seal Pup Elite on my vest. No matter how you arrange them there is always room for both. These knives can take a beating and still dish it out reliably. Always remember, one = none (and two may still not be enough). i agree that its a good knife but it has many flaws including that if you drop it the handle stars coming losse. Seal PUPs have NEVER been made in China and they aren’t now. They are made in Taiwan. don,almost evrything is made in china Schrade,smith & wesson,coleman,im not sure about gerber i own older knives from gerber that were made in the u.s.a.,. the only thing i can think of thats still made in the usa is marlin, i think i cant say for sure , so good luck looking for u.s.a made stuff especily weapons or camping equipment.unless you buy older knives and camping gear. I’ve been looking at getting a Ka-Bar 1277. From the reviews, it will fit the purpose that I’m getting it for. Only complaint is the sheath. Anyone know a sheath that will fit a 9″ Ka-Bar that is a bit more rugged than the crap one it comes with? There are some Gerber knives made here in the U.S., but they are becoming fewer and far between in their product lineup. One of their U.S. made knives I have that has really held up to abuse is the Prodigy. It depends on the product from almost all of these product lines. Buck, Gerber, and SOG all have knives made both abroad and here in the U.S. The Seal Pup is made in Japan AUS-6 steel, the Seal Pup Elite is AUS-8 made in Taiwan… I’ve got both and both are tough as hell. They aren’t Chinese junk by a long shot. The knives that all three of the above listed brands have made in China I wouldn’t spend $2 on. They have all proven to be junk in my experience. It’s just a way to have a product in those price ranges to compete with other junk products at the lower end products. They don’t seem to realize it tarnishes their reputations as people will sometimes associate everything they make as being poor quality chinese junk after they have bought one of them. So wrong. Kah-bar and Ontario (just to name a couple) are made in the good ol USA. Not saying the SOG isnt a fine knife, but if im going to buy a knife to trust my life on post shtf situation it will be USA made. Benchmade…….very well made, very tuff and awesome blade….100% made in the USA, because I have ordered a few directly from them and spoken with them at Benchmade direct. Some knives are made when you order them. You could also buy a D2 billet….or S90V billet and try forging your own blade…..